Mr Sad here was awake at Stupid O'Clock to watch the first practice session of the new season (in bed), the second just finished too. Because they were running full tanks and empty tanks you cant really tell who was quick or not. In the first session Schumi's car looked evil bottoming out everywhere and MS wasn't best pleased with it. However its a long time since an F1 car had to run with a whole race worth of fuel on board. We find out where they really stand when they qualify tommorow. Whatever tyres the top 10 do their fastest lap with, that's the set they start the race with - so if you do your lap hammering a set of soft tyres, they won't last long on Sunday, especially on full tanks. Lots of cars are now using the ugly 'sharks fin' on the rear bodywork, like Renault had last year, notably Ferrari and McLaren, but not Mercedes. It makes the car more stable, plus you can put some lucrative advertising there. Location: On a mission to insult every member of Eater. Just sitting down to watch the Qualifying sessions. This season should be good. No. IT should be GREAT!. I can almost smell the fumes. you bloody nigeria scammer you scamm me of 6,800pounds : Billy a cheque scammer. So. Vettel gets pole for the 1st race for Red Bull. Ferrari get 2nd & 3rd. Too bad Mercedes hasn't found the right setup to fully compete with RBR and Ferrari yet. I also noticed many teams have chosen a rather soft rear suspension, and saw many cars bottoming out at some bumpy stages of the track. I wonder what will happen when the drivers will be pushing hard with an extra 150 kg fuel load during the first stage of the race tomorrow. I'm also curious about the difference between the teams (all major ones) starting off with the soft tires and Force India (Sutil), that made (in my opinion) a more sensible choice to start on the hard compound. I hope this season will be a spectacle. It has all the signs. Let the games begin! Interviewed by the BBC, Rubens was very chipper at the thought of starting close behind Schumacher, but on new tyres. After years of not being allowed to beat him, that should be quite a motivation! Schumi has been half a second slower than Rosberg all weekend, maybe its just as well I never got the £10 on him when he was still unsigned and 8 to 1. I now think Vettel looks like the man to beat. The McLarens dont look very fast, despite their trick rear wing. Red Bull looked good until Vettel's exhaust had a problem, then Ferrari's were on their own. Everyone else looked fairly ordinary. Cosworth engined cars had a poor showing in the main. Hamilton looks like he can get a lot more from the Maclaren than Button can. Nice to Massa had a great return to F1. I hoped to see more of a fight. Too bad both Massa and Vettel faced technical problems that prevented some extra excitement. Still a great job by Ferrari and McLaren. On to the next one. Crongrats to Alonso and Ferrari on the win. I wonder if the Renault engine is going to let down Red Bull again this year. Nearly 10 seconds covered the field in qualifying. That is too much. Nice to see Lotus get both cars to the finish. F1 heads into the first double-header event of the season with the Australian Grand Prix at Melbourne followed by the trip to Sepang for next week’s Malaysian Grand Prix. Hopefully, we'll see a bit more real racing, if last year is anything to go by. 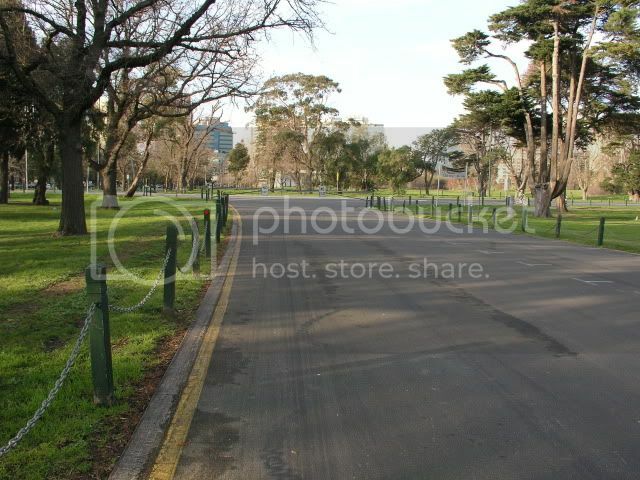 From the Cropper Archive, this is what Albert Park looked like when I visited in 2007, only the odd blacked out serrated curve and skidmark to hint at the F1 mayhem that arrives for a few days each year. Wet weather disrupted things, and some teams ran around with full tanks, but it ended up Hamilton from Button, Webber and Schumacher. For me, Qualifying and the Race are at Stupid O'Clock in the morning, so I don't understand why they compromise safety by running the race at dusk (their time), which some drivers are unhappy about. 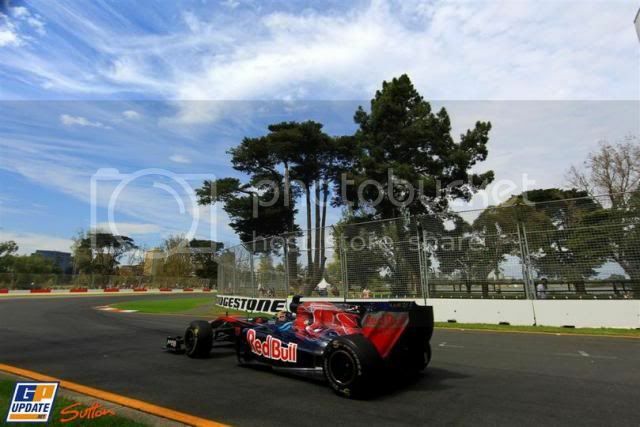 The RBR's will be hard to beat tomorrow if the weather conditions are dry. I'm quite surprised to see Lewis being out-qualified by Jenson. More races like this one please, gents. Close racing from start to finish. Brilliant choice of Button to change from intermediates to slicks very quickly after the raining stopped, and keeping his set of soft tires in one piece for 52 laps! Button looked a right wally after he changed to slicks and ran straight off the track. That was before his strategy turned out to be an inspired call. Lewis reminded me of Rubens last year moaning about Button getting a better strategy, when it was Lewis who kept moaning about his tyres - left to him he would have 3 stopped! This comes back to the discussion that we had in the off season - JB's smooth style preserves the tyres that others shred around him. A very enjoyable race, which should shut up all the doommongers who slept through the Bahrian GP. ^ The numbers 1-4 all did some 50 laps on the same set of tires. Maybe a combination of smooth styles, low tarmac temperature after the rain, tactics, and a nice job by Bridgestone in delivering very sustainable tyres. Well done, RBR. They are clearly the ones to beat at the moment. Too bad McLaren and Ferrari messed up in the rainy qualifying tombola, otherwise this race would have had every potential to become more spectacular. The scary thing is that Vettel could have won each race so far, if he didnt keep having reliability issues. Hamilton and Button set the fastest times overnight in practice for the Chinese GP, meanwhile Sebastian Buemi had a big scare when both his front wheels buggered off at once. I thought they were supposed to have wheel tethers - one wheel ended up in a public area. Alonso popped another engine, he stormed off in a strop. So, what's there to say about a wet race? Again, tactics played a major role. Another good call from Button to stay out on the slicks when it started to rain, when most pitted to get intermediates, and had to change back a few laps later. I noticed Schumi is hardly the driver he once was, being overtaken by several (relative) rookies. He's not doing himself and his reputation a favour, being unable to match his teammate for several races in a row now. Lewis was great, finishing second with two pit stops more than Jenson. For me he was the man of the race. Entertaining though. I think they should have all the races somewhere where rain is likely, like Manchester. Lewis looked right out of it after his extra stops, he did so well to catch up. I'd have put my shirt on Vettel winning if he didn't break down, good job I didn't! Jenson proved his Championship was no fluke, again his style helped his tyres to just about hang on until the end. Schumi was disappointing, but every time we went on board his back wheels were spinning up like crazy. Good driver but poor setup. The latest news is that despite acting like a pair of dickheads in the pitlane, Vettel and Hamilton just got a bollocking, but no penalty. What does Red Bull have to do to get a break. They have been on the front row/pole for every race yet they can not deliver on Sunday. Horner has to be pounding his head against the wall over this. Buemi is lucky to be alive after losing both front wheels at 200 mph. But is was kind of funny watching him try to steer the car with no front wheels. Now for Europe. Maybe better luck for Red Bull. Mclaren is looking pretty good. Not sure about Ferrari. Barcelona kicks off with Free Practice 1 tomorrow morning. Alonso will have the pressure of wanting to do well in front of his home crowd, the FIA have allowed Ferrari to make changes to their engine after a few have gone 'pop', however they still seem destined to run out before the end of the season - once they have used their allocation its a 10 place grid drop each time you put a fresh one in. The teams' motorhomes make their first appearance of the season at the Circuit de Catalunya this weekend. Red Bull will be hosting a pool party at theirs but it will be another three weeks until Force India are ready to show off a system that automatically orders each newcomer their preferred drinks at the bar. If they want me to test it for them at Silverstone, I'd be only too happy to. Normally on a Monday, we're saying how unlucky the Red Bulls were, this time they finished 1 and 3, and Hamilton got the short straw - his wheel flew apart on the last lap but one, while running 2nd Go straight to the wall, do not pass go. I guess karma evens stuff out in the end. Schumi beat his teamate all weekend, every session. I don't think Rosberg will be very pleased with the new, longer Merc chassis, but Schumi does. Vettel lost his 2nd place because of the first pit stop, which was 4 seconds longer than Webber's. Too bad Lewis blew his tyre in the penultimate lap. He deserved to be on the podium in my opinion. It seems Lewis' puncture was caused by a stone getting caught between the rim and brake, and machining away the rim, thats what that curved piece flying off in my picture was. The same thing happened to Hekki last year. No prizes for guessing where this weeks race is..
Ive been to Monaco once, I was refused entry to the casino (ripped denim shorts) then thrown off the steps by security for sitting there waiting for Hayley to come out. I am clearly too classy for the place. I did get to walk some of the track, though like Albert Park, it's harder than you'd think to spot in places with all the regular traffic rushing around.